[Private Tour] Try local food and explore the nostalgic streets of Yanesen. 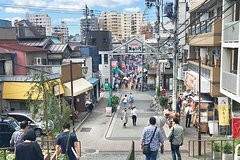 Yanesen stretches out over two wards; Bunkyoku and Taitoku, and is the generic name of the three old shopping streets; Yanaka, Nezu and Sendagi, of this area. On this tour you will explore this nostalgic area, meeting the locals and trying their local street food, such as croquets and onigiri rice balls. Other things that we recommend you try are kakigori; shaved ice with fruity syrup, and a drink in an izakaya; a Japanese pub. Other than the cuisine, you will also be introduced to traditional shops that sells Japanese accessories, a hand puppet show with elaborate and expressive puppets, and a shrine with a tunnel of vibrant red torii gates. Live like the locals for a day in Yanesen! • Explore the streets of Yanesen's shopping district and enjoy its nostalgic Showa period (1926-1989) atmosphere. • Taste famous Japanese sweet and savoury food! • Purchase cute gifts and food to take back with you as souvenirs. • Himitsudo: Taste the kakigori shaved ice with homemade fruit sauce at this shop. Popular among the locals! • Ikayakiyakiya: Try an Osaka speciality, ikayaki, with a delicious sauce that has been loved by people over the years. • Niku no Suzuki: Their freshly fried menchi-katsu is beyond delicious! • Yanaka Shippoya: Try a donut stick, resembling the shape and pattern of a cat's tail. Our favourites are the creamy ones! • Kanekichien: You can shop for equipment used in Japanese tea ceremonies in this lovely shop. • Echigoya Honten: Taste Japanese beer and sake, and enjoy drinking the Japanese way; kadouchi. • Hand Puppets Shokichi: Enjoy this fantastically expressive puppet show by professional puppeteers! • Nezu Shrine: Visit this shrine, also known as a "power spot", right in the center of Nezu, and walk through its magnificent tower gate and tunnel of red torii gates. • Onigiri Café Risaku: Taste the soft and beautiful onigiri rice balls, a typical Japanese food, along with a delicious bowl of pork soup.